Mildy Shampoo is a mild and gentle shampoo formulated with aloe vera. The shampoo can be used for all types of hair to nourish hair internally and make them clean and healthy. The formula consisting of aloe vera has proven to work particularly well for dry hair to help relieve dry, itchy scalps and dandruff while leaving the hair soft, hydrated and manageable even with frequent use. Some people may also use the shampoo to prevent and treat hair loss. How is Mildy Shampoo used? Mildy Shampoo should be applied topically every day or as required. The shampoo should be gently massaged into the wet scalp and hair. Allow the shampoo to thoroughly treat the hair by leaving it in for around 2 minutes before rinsing off. Rinse it out with water and repeat the treatment if needed. 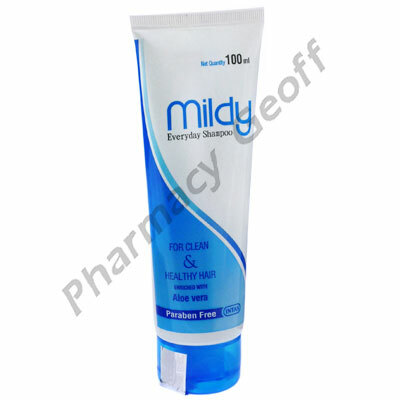 Mildy Shampoo is not always suitable for all patients. Always consult your health care provider prior to using this medication if you are pregnant, breastfeeding, trying to conceive, using any other medication (prescription or non-prescription), using any herbal products or supplements, or if you have any allergies or other health problems.